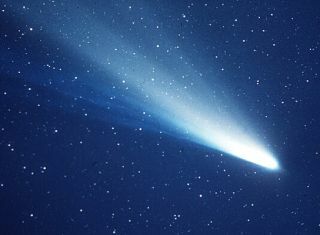 Bits and pieces of the famous Halley's Comet will light up the overnight sky in a promising meteor shower, weather permitting, skywatching experts say. The annual Eta Aquarid meteor shower will peak early tomorrow morning (May 6) and is expected to put on a dazzling display of "shooting stars" for skywatchers graced with good weather and clear skies. That's because the moon, which is currently in its unlit new phase, won't interfere with the meteor light show as it did with last month's Lyrid shower. "Under ideal conditions (a dark, moonless sky) about 30 to 60 of these very swift meteors can be seen per hour," advises SPACE.com skywatching columnist Joe Rao. "And with a new moon on May 3 this is one of those years when observing conditions will be perfect." This sky map of the Eta Aquarid meteor shower shows where the meteors will appear to originate from during their display. The best time to see them will be early Friday morning before 2 a.m. and 3 a.m. Local Time. NASA scientists say that the combination of the Eta Aquarid meteor shower and lack of moonlight should offer a rare chance for avid meteor-hunting skywatchers. "This is your one chance this year to see meteors blaze across the sky without glaring moonlight dimming them," said NASA astronomer Bill Cooke, a member of the Space Environments team at the Marshall Space Flight Center in Huntsville, Ala., in a statement. The Eta Aquarid meteors appear to radiate out of the east-southeastern sky in the constellation Aquarius. But according to Cooke, you don't have stare in the constellation's direction to see the meteors. "Meteors can appear in any part of the sky," Cooke explained. "In fact their trails will tend to point back toward the radiant, so if you look that way the meteor may appear somewhat stubby. They'll appear much longer going by you than coming at you." If you have a dark, wide view of the night sky, you should be able to see some meteors by just lying down and gazing upwards. A good blanket or a comfortable outdoor chair is useful for long skywatching vigils. "Eta Aquarids are fast, moving at 66 km/s (148,000 mph), and often trace long paths across the sky, sometimes leaving glowing, persistent trains," Cooke said. "In the Northern Hemisphere, depending on your latitude [the closer to the equator the better], you should see from 10 to 40 meteors just before dawn."